This Friday, Spike Lee is delivering one of the best films to hit theaters since Get Out. 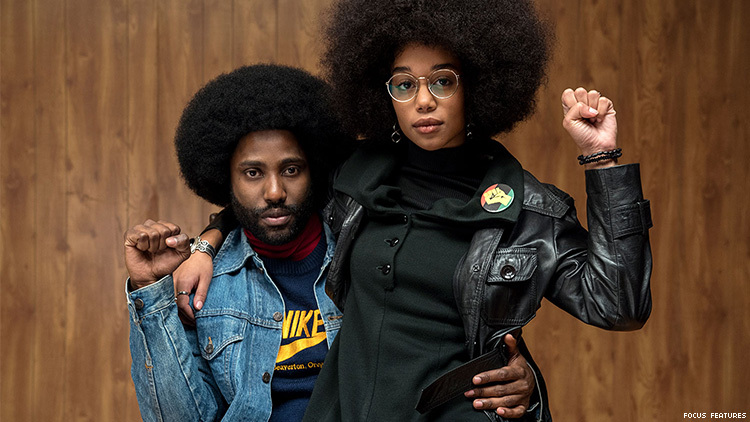 Based on one of the craziest true stories you’ve likely never heard of, BlacKkKlansman is undoubtedly going to be this year’s breakout hit. For good reason. Let’s break it down: In the early-1970s, a Black man named Ron Stallworth (John David Washington) became the first Black detective to serve in the Colorado Springs Police Department. Determined to make a name for himself, he bravely sets out on a dangerous mission to infiltrate and expose the Ku Klux Klan. Turns out, you can’t trick the KKK as a Black man easily, so he teams up with colleague Flip Zimmerman (Adam Driver) to uncover mad truths about the racist organization. A Jewish man, the film beautifully weaves Zimmerman’s experiences of passing and code-switching in a world of white supremacists with Stallworth’s own as a Black man not only in the world, but in the police department. Together, the duo sets out to take down the hate group as the KKK aims to sanitize its violent rhetoric to appeal to the mainstream. The real Stallworth was even given a KKK membership card from David Duke himself — and he still has it today! Produced by the team behind the Academy-Award winning Get Out, the film also stars Laura Harrier as Patrice Dumas, a character loosely based on activists Kathleen Cleaver and Angela Davis; and Topher Grace as David Duke, former Grand Wizard of the KKK. Admittedly, Washington, who attended Morehouse College in Atlanta (a historically Black college), hadn’t heard of Stallworth’s story before reading the script. One of the incredible messages Lee invokes in the film is the lie of white supremacy. "It’s all lies," Lee says to Chill. "The truth is this country was built on the genocide of Native Americans and slavery. And if we don’t start there, I don’t know what to say. Let’s start at the beginning."